The MacBook is one of the most popular laptops in the computer world and also very popular in the world. They are sleek in design and ultra powerful in performance as well as very efficient in power consumption. If your macbook power adapter is broken or it is lost,or you need a additional magsafe power adapter when you are traveling. How to choose the right macbook charger?It is very easy to select the right Macbook charger,confirming the right power ratings as well as right connector types. How to Locate the Connector Type? There are two different connector types for the Apple MacBook: the Magsafe connector and the Magsafe 2 connector. The main difference is the appearance between the two, in that the Magsafe 2 connector has a thinner connecting piece. 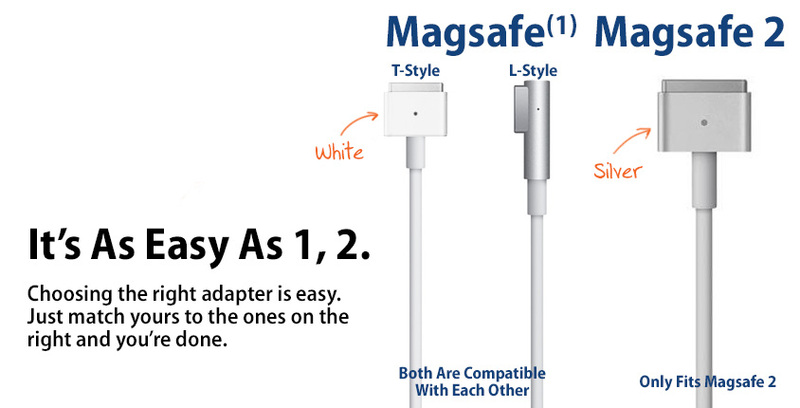 The choices are either the Magsafe or Magsafe 2. Any MacBook that was made from mid 2012 onward uses the newer Magsafe 2 connector. How to Locate the Power Rating? To find MacBook chargers on our site, there are three kinds of power rating magsafe charger on our website,45 watt, 60 watt, or 85 watt. It should be noted that higher wattage chargers can be used on the lower wattage laptops, but not vice versa.For example, an 85-watt charger can be used on a MacBook that requires a 45 watt or 60 watt charger; however, a 45-watt charger cannot be used on a MacBook that requires a 60 watt or 85 watt charger. You can find the Power Rating Details on your orignal macbook charger,It is very easy.